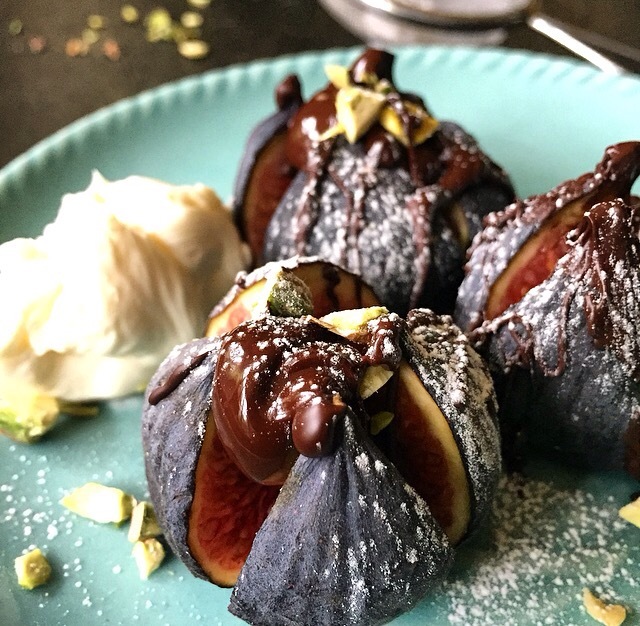 A few weeks back whilst out shopping I spotted some figs, I just couldn’t resist buying them! I’m not always upto speed with seasonal foods, some are just plain obvious and others not so. Figs being one of them, when I saw them I was a little confused but knowing they are delicious when baked I bought them anyway. The first ones I baked for a few mins in my Aga and had them as a light lunch with goats cheese, honey, sage and walnuts ( pic on IG) then the ones that were left ripened beautifully so I made this dessert, which is a perfect and more importantly stress free dessert for a dinner party. The only problem was I stupidly scribbled the recipe on a piece of paper instead of putting it straight into my notebook and it went walkies! Until today!!! So hence my reason for posting it now. So this is perfect when figs are a plenty and perfectly ripe but remember you can bake them first to soften them up, just keep an eye on them because they may only take 5mins! I’ve used orange blossom water but of course you can use alcohol and turn them into a boozy fig dessert. Which would also be delicious, it’s just I’m not over keen on alcohol in my desserts!!! Which includes sherry in trifle!!!! The quantity of orange blossom water I’ve used is a guide so have a taste and add more if you think it needs it. A baking tray lined if you think they need baking, preheat oven to 180/gas 4 …. I put them in the roasting oven of my Aga, remember to keep an eye on them because they may only need 5 mins! Cut each fig into 4 without cutting through to the bottom, if you are baking them do it now if not then just continue. Melt the chocolate over a pan of just simmering water, when it has melted take it off the heat add the cream and the orange blossom water, stirring all the time. In a seperate bowl mix the mascarpone and the sifted icing sugar. Now plate up, add two figs to each plate, pour over the warm chocolate orange sauce add a good dollop of the mascarpone and icing sugar mix then sprinkle over the chopped pistachios. You can if you want sprinkle over some extra icing sugar. Pour a glass of chilled dessert wine and you have a wonderful, easy, pretty dessert. This sounds absolutely delicious Deb. I have a fig tree in the garden which we only planted last year. I think there are 9 figs on it (how sad is it that I know!!) and when they ripen, I will give this recipe a go.